Tuesday 11th October @ 8pm: Women in Medieval London. Lecture by Dr Caroline Cartwright. Tuesday 10th January @8pm: My uncle, the Battle of Britain VC. Lecture by James Nicolson. Tuesday 14th February @8pm: To Be Confirmed. Tuesday 14h March @8pm: Bugging the Nazis in WW2: Trent Park's Secret History. Lecture by Helen Fry. HADRIAN’S WALL - starting 7th November. Enrolling now. EXPLORING ENGLISH: MAGNA CARTA (started 18th July). HOMO FLORESIENSIS UNCOVERED: THE SCIENCE OF ‘THE HOBBIT’ (started 18th July). Altogether there are over 50 courses from Family History to Climate Change, plus a couple on Shakespeare. All are on-line & free. All the material is provided; no books to buy/ read, essays or exams. Learning is by dialogue with tutors/other students. All the material is accessible on-line (once enrolled) at any stage, so it's easy to join late, & catch up if necessary. An unexpected interesting by-product with these courses is the chance to converse with fellow students/ enthusiasts located literally all over the planet! Historian Bettany Hughes and archaeologist Julian Richards presented awards to some of the UK's leading archaeologists, showcasing new discoveries up and down the country that are transforming our understanding of Britain's past. The 2016 winners reflect the rich diversity of archaeology across the UK, from the industrial archaeology of the Welsh Slate industry, winner of ‘Best Book’, to the major discoveries being unearthed Under London and in Cambridgeshire at Must Farm, which was awarded 'Best Discovery' for reshaping our knowledge of the British Bronze Age. In a presentation about his Highly Commended Stonehenge book, Mike Parker Pearson reflected on the British public's increasing fascination with the distant past, fuelled by technological advances, archaeological innovation and new knowledge. - the largest ever archaeological site in Oxford, while enabling readers to examine the unique Mesolithic Star Carr pendant for themselves using digital publishing technologies was the focus of the Postglacial project's electronic article in Internet Archaeology. Community engagement and passion for their shared past shone through the Battles, Bricks and Bridges project, which brought together archaeology and reminiscing to identify a previously disputed battlefield site in County Fermanagh and restore a seventeenth-century bridge, turning villagers' memories of history and culture into heritage for future generations. The excavator of Danebury Hill Fort, the Sacred Spring in Bath and Fishbourne Roman Palace, Professor Sir Barry Cunliffe CBE, was recognised for his own exceptional contribution to our understanding of the past with an Award for Outstanding Achievement. In an inspiring acceptance speech, Barry called archaeology "a family", saying that archaeologists all shared the desire to communicate their knowledge and were "creative, vital and inclusive". “Archaeology is such an important part of our nation’s heritage, helping us understand our culture and how people lived in the past.". It's difficult to imagine living conditions in London 160 years ago, when overcrowded cities were unhealthy places to live, disease was rife and the stench of horse manure and human waste was pervasive. Deaths from sickness were at a level not seen since the Black Death. In London, with a population of three million, the problem was becoming a crisis. Thousands of homes still had stinking cesspits beneath them and in the poorest areas this vile effluent oozed up through the floorboards. In 1847 the newly formed Metropolitan Commission of Sewers took action, banning all cesspits and stating that all privy refuse should be discharged in the sewers. This added to the waste from the water closets which had recently become popular among the city's richer residents. 49) killed over fourteen thousand Londoners and the smell over London got worse. Only essential commercial traffic continued to ply the river. In the 1850s and 1860s poor Londoners found a new source of income. Those hardy souls prepared to enter the sewer outfalls during low tide scoured the mud for old metal, coins, clothes and rags and anything else that could be sold later. These sewer-hunters, or 'toshers', as they were known, always travelled in groups of three or four for safety, armed with a long rake which guarded against vermin but which could also be used for pulling themselves out when they got stuck in the mud or sludge. The venerable social reformer Henry Mayhew, in his London Labour and the London Poor (fourth volume, 1861) estimated that this unconventional trade was worth overall around £20,000 a year, a tidy sum to say the least. Then in 1858 a long very hot summer made the stench unbearable. Tons of chalk, lime and carbolic acid were tipped into the Thames but nothing could mask 'The Great Stink'. Sheets were hung on the riverside windows of the House of Commons and soaked in chloride of lime solution (bleach), to no avail. Prime Minster Benjamin Disraeli described the river as "a Stygian Pool reeking with ineffable and unbearable horror." MPs were forced to act. Within eighteen days a bill was passed and the railway engineer Joseph Bazalgette (1819–91) was tasked with the vast job of building London's sewers, apparently on the recommendation of Isambard Kingdom Brunel, also of Huguenot descent. Bazalgette and his team began work in 1859 and in the following nine years, and at a cost of £4.2 million (£500 million in today's money) they built four pumping stations, 82 miles of intercepting sewers parallel to the Thames and 1,100 miles of street sewers with outfalls at Barking and Crossness; much of this is still in use today. The Observer described Bazalgette's work as "the most extensive and wonderful feat of modern times". The system was officially opened by the Prince of Wales in 1865 although the whole project was not actually completed for another ten years. The entire network was somewhat over-engineered, with sewer diameters far greater than was needed at the time, but Bazalgette's foresight together with the quality of the brickwork and sound Victorian engineering have meant that the system generally still works well today. Bazalgette lived at 17 Hamilton Terrace, St John's Wood; he is commemorated by a blue plaque that was placed on the house in the 1970s. Towards the end of his life he moved south of the river, to a house in Arthur Road, SW19, where he died, perhaps from overwork, in 1891. He is buried in nearby St Mary's Church in Wimbledon Village where there is a mausoleum to his memory. There is a second memorial on the Victoria Embankment, a major part of his subterranean achievements. Southall is on the Grand Union Canal as it makes its way to join the Thames at Brentford. With the building of the Great Western Railway passing through Southall, chief engineer Isambard Kingdom Brunel was charged with constructing a branch line from Southall to Brentford. This would need to cross the canal as well as negotiating several roads. 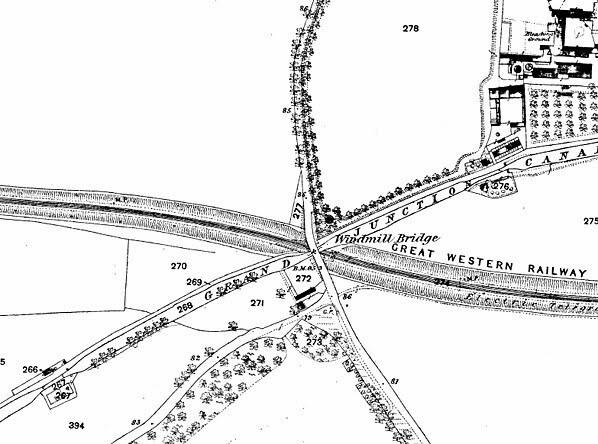 Brunel calculated that his cheapest option was to pass under the canal at a point where a road bridged the canal, so that he crossed both with one bridge. Thus was born the three bridges, a unique construction to this day. The line opened in 1859 originally using broad gauge though later replaced with two standard gauge tracks. One track has now been removed. The project required Brunel to construct a cast iron trough, eight feet deep, supported by iron girders on a central brick pier to contain the canal, and his contract with the Canal Company imposed a fine for every hour that the canal was out of service. Although passenger services have been discontinued, the railway still has occasional freight traffic. The line has also been used for some heritage steam engines, including Flying Scotsman when it was for a while stationed at Southall Steam Centre. Now there are plans to restore the removed track and reinstate passenger services by 2020 to link up with the Crossrail service, so Brunel’s innovative bridge will have an ongoing use. The bridge has been used in carefully posed promotional photographs by several organisations. The picture shows it being used by British Railways, British Waterways and British Road Services. The bridge has been designated a Scheduled Ancient Monument. A number of HADAS members attended a talk on 16th June organised by the Battle of Barnet Partnership and given by Sam Wilson of Huddersfield University. Sam is the Archaeological Supervisor of the project. Battlefield Archaeology, Sam explained, is a sub-set of conflict archaeology dealing in particular with the sites of battles or in some cases, potential battles. It is a relatively new discipline which had developed following the invention of metal detectors. It had been successful in the mid-1980s in America when investigating the site of the Battle of the Little Bighorn, with the detectors finding lots of cartridge cases and other military items. Newer technology such as ground penetrating radar and LiDAR (Light Detection and Ranging) from aircraft, adding to aerial photography, helped provide topographical information not always apparent at ground level. information and the discovery of battlefield remains, largely metallic in nature. With the battle of Bosworth Field, the process of proving that the accepted site was incorrect, and locating the correct site had taken about 5 years. The conclusion had been confirmed by a cluster of over 30 cannon balls. These were largely lead – iron does not normally last for long periods in the ground. Also, there is so much “modern” iron on fields that detectorists set their machines to ignore it. Once the site had been found, all the information came together. As far as the Battle of Barnet is concerned, it is still early days. Very little has been found that points to a particular location, but some agricultural land can only be inspected outside the growing season. The current funding runs to this August, but it was hoped that more could be found. So watch this space ..... or maybe that one. This site bounded by Park Road and Heron Rise has a fascinating past being founded by Rev John Ward in 1934. He created a complex mixture of museum, building reconstruction, experimental archaeology and ethnography. It is said to be one of the earliest ‘open air’ museums of its kind. Based around an existing Victorian Villa called Hadley Hall the most notable ‘reconstruction’ was a medieval tithe barn moved from Birchington-on-Sea, Kent (this was converted into a chapel which still stands). Other areas in the park contained an African village, a prehistoric village complete with roundhouses, smithy, Roman villa and Witches Cottage amongst others. Other structures housed the museum collection of some 90,000 objects. The park ran successfully until 1940 when questions were asked how the museum was being run – there was a semi-monastic, religious and mystical feel to it. After a court case the collections were sold to pay costs, Ward took his community to Cypress where he died in 1949, and the park was sold on to become the Abbey Arts Centre. Many of the objects were scattered; Liverpool Museum holds a number of Tibetan figurines known from Ward’s collection. Remarkably 4500 objects made their way to Australia and now form the Abbey Museum of Art & Archaeology, Queensland, opened in 1986. The New Barnet site has become subject to planning applications for 3-4 two-storey dwellings on the southern half of the park, the northern half with the chapel, villa and cottages is unaffected. The latest of the applications dates to May/June 2016. 2016. Or see the planning application 16/3318/FUL, heritage statement, on Barnet Council’s website. Harvey Sheldon, who is president of HADAS, initially gave a brief review of his involvement with the Rose theatre excavation. Firstly, he was employed by the Department of Urban Archaeology of the Museum of London, then ultimately he became chairman of the Rose Theatre Trust formed in 1989, which means he has more than 25 years involvement with the Rose. Whilst this year is widely known to be the 400th anniversary of Shakespeare's death, what is less known is that it also is the 400th anniversary of the death of the man who built the Rose in 1587, namely, Phillip Henslowe, who died on 6 January 1616. With a background slide of the uncovered excavated Rose foundations, Harvey gave us the history of the excavation, which has proved to be very significant to subsequent excavations. He also described the fight to preserve it for future generations, preventing its destruction by the builders. The excavation started in 1988. An office building, Southbridge house, was to be replaced, and the developers acceded to requests for excavation. Harvey showed us various maps on which the Rose's location is indicated. As he said, nowadays there is much more initial investigation of paper records to evaluate whether excavation will reveal anything significant. It was fortunate this was not done so rigorously back in 1988 as maps showing the area at this time had the Rose at the opposite end of the Rose alley. The discovery of the Rose foundations was considered so important at the time, when planning laws did not require archaeological considerations to be taken into account, that Mrs Thatcher subsequently, as a direct result of this excavation, introduced the requirement, which included funding, for all subsequent building development projects. Originally a very short period was allocated for the Rose excavation. Leaving it at the end of the allocated time would have meant that all traces of the Rose would have disappeared unrecorded. Prior to excavation no physical evidence had ever been discovered - no shape, plan, or structural details of any theatre. Some Victorian maps provided the only extant archive, which as previously mentioned was not always accurate. Within 4 weeks, segments of the wall appeared, not at right angles, but showing a polygonal shape. By February 1989, the details revealed had caught public interest. What had been uncovered were the gallery walls, two phases of the stage including a 1592 alteration to enlarge the theatre, a floor sloping towards the stage, and a 14 sided polygonal shape for the original theatre before enlargement. The campaign and publicity accompanying this excavation radically altered the excavation with more time and money required. It was felt that the physical remains deserved more than just recording. Amongst other publicity was an article dated 15 February 1989 in the Times. An added dimension to the campaigning was the involvement of many famous actors who felt that the history of the Rose in the theatre world made it very important to preserve it. After Sir Lawrence Olivier's last public utterance, reported in The Times on 12 May 1989, which included his battle cry of 'God for Harry and the Rose' - he died a few weeks later - and a star studded campaign, the campaign climaxed with Dame Peggy Ashcroft leading a candlelit night vigil on the Rose site. On the following day Mrs Thatcher's Government announced a £1million grant to save the Rose. The government announced one month's moratorium on the building, the result was that the developer agreed that the first floor of the new building would be allocated to display artefacts found during the Rose excavation. These included broken money boxes for the takings and the broken hazel-nut shell surface of the internal drainage ditch for the roof run-off into the standing area. The nutshells may have been a remnant of soap making. All these uncovered artefacts have certainly pushed forward knowledge of the Elizabethan Theatre. Before the building began the site excavation had to be covered over in sand and concrete, both to protect it from potential damage from the building process and also because as the site, which was originally a wetland area, began to dry out the foundations were being damaged, so it was necessary to reinstate the damper environment. June 1989 marked the end of the museum's involvement, when it devolved to English Heritage. In February 1992, the site was granted ancient monument status, so giving it protection. It was then left until 1999, when a temporary exhibition was mounted to highlight the theatre footprint in the basement, and to display the plans being drawn up for its future. Today, it is open for modern tours on Saturdays. The area which had declined in the 1960s from its late 16th century roots is now, partly thanks to Tate Modern and other local development, returned to its former vibrancy. Opening the doors of the Rose displays helps with funding for the Heritage Lottery Fund plan to build a visitor centre which Southwark Council planning department have approved. This will cost £8million, but to qualify for the grant needs a minimum lease of 15 years. Since its construction, the Rose Court building has passed through four owners. The Rose trustees had been negotiating for 18 months with the latest owners, Ho Bee, when they announced plans to sell the building, so negotiations are currently on hold. The trustees are now approaching the government to get pressure to force the lease through. Harvey then showed us a series of slides showing the progress of the excavation and the campaign to raise public profile. This also highlighted the importance of the Rose which was associated with both playwrights Shakespeare and Marlowe, and the actor Edward Alleyn. Henslowe's son-in-law, were endowed to Henslowe's foundation, Dulwich College. Included in these papers are references to 'turned' balusters (for the galleries) like the one of fine oak that was found intact on the 'Globe' site. There were many images showing the actors involved in the publicity campaign on the site, including Dame Peggy Ashcroft's sit-in. From 2000 to 2001, Susanna York put on a play to raise funds for the Trust, and there have been other plays since. There were various images of this. Images showing mock-ups of the future planning ideas which will happen if the lease issue for the building is resolved were displayed. There is also now an opportunity to excavate the last 1/3 of the Rose foundations, to confirm (or otherwise) that its shape is as surmised from the 1988/9 excavation, which will come under the same protection as the rest of the current foundations. The National Heritage for England (NHLE) contains nearly 400,000 entries (predominantly Listed Buildings) available online from Historic England. However, the list lacks images and many of the entries, particularly older list descriptions are very brief and out of date. Historic England is aware that there are many individuals and organisations that have a good deal more information about these buildings and sites than available in the description in the NHLE entry. To bring this knowledge together with The List, Historic England has launched Enriching The List (ETL) crowd- sourcing initiative to open up the NHLE to additional information and images from its users. This additional content appears after the list entry and separated from it so it is clear that it is not part of the statutory description. Users can upload additional information, up to four images per post, and provide links to other online sources or images. These are then moderated before being published to ensure that they meet the terms and conditions. Following a trial period, the project was launched on 7th June and at the time of writing over 2,500 contributions have been published, including over 3,000 images. The feedback from users so far has been overwhelmingly positive with users saying how easy it is to submit information and photographs and what a great idea they think it is. Civic societies contain a vast resource of knowledge about the heritage of their local areas, both as organisations and through their individual members. Historic England is inviting the civic movement to help them enrich The List, and individuals can sign up as volunteers online. You can find out more about the project including how to take part and some of the content uploaded so far at www.historicengland.org.uk/etl. If you have any queries or feedback please email EnrichingTheList@HistoricEngland.org.uk. Some HADAS members may have noticed our interest in canals. The long HADAS outings have often included a stop at a canal, and sometimes a ride on a narrowboat. We have been taking holidays on canal boats for over 30 years (not every year) and are very interested in their history and their place in industrial archaeology. This year, we ventured north of Hadrian’s Wall for six days on these Scottish canals. The first act of parliament relating to this canal, received the royal assent on the 8th of March 1768, making it very early as British canals go, and the first sea to sea canal in the world. It opened in 1790 and ran from Bowling sea basin on the River Clyde to the River Carron which flows into the Firth of Forth, with a short spur into Glasgow. To accommodate seagoing craft, it is wider than most canals and once operated steamboat trips. For much of its length it follows close to the Roman Antonine Wall. The Union Canal joined the Forth and Clyde at Falkirk, giving access to Edinburgh. This is a contour canal closely following the 240 feet contour line for over 30 miles, so that the only locks, 11 of them, were in the last half mile where it dropped to join the Forth and Clyde. One wonders at the surveying that made this possible. As with most canals, the two fell out of use, and both were closed in the early 1960s. The construction of the M9 motorway blocked the end of the canal at the eastern end, and on the Union Canal, most of the locks were filled in and housing built on the reclaimed land. So when volunteers wanted to restore and re-open both canals, they had real challenges to face. The Forth and Clyde canal was the easier, though it needed a new exit to the Carron River, and two other locks had to be replaced. Fortunately, as part of the Millennium celebrations, Lottery funding was made available to help with both canals. On the Union Canal, a new stretch of canal was excavated, with a staircase of two new locks, a new tunnel, the first new canal tunnel in Britain for over 100 years. To move boats the 80 feet between the tunnel and the Forth and Clyde, a magnificent new construction known as the Falkirk Wheel was opened by the Queen in 2002. The Falkirk Wheel has become a tourist attraction with coach loads arriving to ride in trip boats on the wheel and through the tunnel. The eastern end of the Forth and Clyde is now guarded by the two largest equine statues in the world, completed in 2013, and about 100 feet tall. Known as The Kelpies, the horses’ heads are based on mythical creatures with the strength of 10 horses and modelled on two Clydesdale horses, the type that hauled the canal barges. The construction is of sheet steel sections, which at night are lit from the inside in changing colours. Two smaller copies, a mere 5 foot high, are at the side of the Wheel. Tourists are also served at the wheel by an appropriately stocked shop, selling among other things bottles of a local brew branded as “Wheel Ale”! Thursday 8th September, 8pm. Battle of Barnet Project. Pennefather Hall, Christ Church, St Albans Road, Barnet EN5 4LA. Altars to Apps: commemorating and interpreting UK battlefields across 1000 years. Talk by Simon Marsh (Battlefields Trust). Tickets on door £5 including refreshments. Friday 9th September, 7.45pm. Enfield Archaeological Society. Jubilee Hall, Parsonage Lane,, Enfield EN2 0AJ. Life in Post-medieval Southwark: finds from recent excavations. Talk by Jacqui Pearce (MOLA & HADAS course tutor). Tuesday 13th September, 7.45pm. Amateur Geological Society. The Parlour, St Margaret’s Church, Victoria Ave N3 1BD (off Hendon Way). Virtual Fossils: soft bodied sensations from the Silurian. Talk by Prof Derek Siveter. Friday 16th September, 7pm. COLAS. St Olave’s Parish Hall, Mark Lane, EC3R 7LQ. The King’s Observatory: the quest for Shene charterhouse & the search for an old latrine. Talk by Bob Cowie (MOLA). Visitors £2. Friday 16th September, 7.30pm. Wembley History Society. English Martyrs Hall, Chalkhill Rd, Wembley HA9 9EW (top of Blackbird Hill). Dirty London. Talk by Pat Dutson. Visitors £3. Refreshments 50p. Saturday 17th September. Barnet Museum and Local History Society. Coach outing to Rochester. For details please contact Pat Alison at 37 Ladbroke Drive, Potters Bar EN6 1QR. Telephone 01707 858430 or Barnet Museum on 020 8440 8066. Email: enquiries@barnetmuseum.org.uk. Saturday 17th & Sunday 18th September. London Open House Weekend. Free access to over 800 buildings. Details at www.openhouselondon.org.uk. Including the Friends of Brompton Cemetery. Guided tours of the chapel starting at 2pm on both days. Tuesday 20th September, 6pm. Gresham College at the Museum of London. 150 London Wall EC2Y 5HN. Queen Victoria. Talk by Prof Vernon Bogdanor. FREE. Also Wednesday 21st September, 1pm. The Cradle of Stonehenge? Blick Mead - a Mesolithic site in the Stonehenge landscape. Talk by Prof David Jaques. Sunday 25th September to Sunday 2nd October. Barnet Borough Arts Council. The Spires, High Street, Barnet EN5 5XY. Arts and Information Exhibition (including HADAS). Wednesday 28th, September, 7.45pm. Friern Barnet & District Local History Society. North Middlesex Golf Club, The Manor House, Friern Barnet Lane, N20 0NL. The Cinema Museum. Talk by Martin Humphries. Visitors £2. Refreshments & bar. Thursday 29th September, 8pm. Finchley Society. Outreach meeting in East Finchley (please see Sept/Oct Finchley Society newsletter for details). Visitors £2. Until Friday 30th September. Stephens House & Gardens (Avenue House). Hospitals for Heroes. FREE summer exhibition of Avenue House as a VAD hospital during WW1 and as the RAF Central Hospital from 1919. Open Tues/Wed/Thurs 1-4.30pm. Sat & Sun 12-4.30pm.